This book is about a Chief Warrant Officer in the US Military who spent 30 years as an Intelligence Officer conducting the most classified and dangerous Operations from the Cold War in Berlin to today. This story is about the consequences of that career as a Covert Operations Agent. "Alive Day" is currently optioned by Phoenix Pictures to become a blockbuster movie. Watch for the rest of the series as it becomes available! 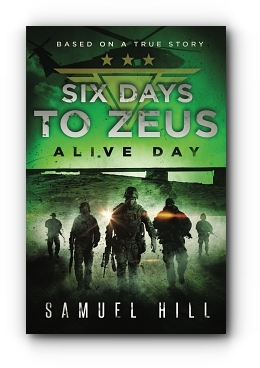 Six Days to Zeus: Alive Day is a fictional account of a real soldier's life. Approved by the Pentagon Pre-Publication Security Review process, the names, dates, places, and military tactics have been changed to protect classified information. Although every day was filled with highly classified missions and Special Compartmented Intelligence (SCI), the heart of this story has nothing to do with classified information. This book is not a kiss and tell, but rather a book about the lessons in life we all must learn, and about the oftentimes expensive tuition we must pay. Because, in the end, life is about "what you do to other people." Six Days to Zeus: Alive Day is dedicated to the men and women who work in the shadows to prosecute U.S. Foreign Policy with a ferocious level of intent. These are the men and women of "Tier One Intelligence Support Activities," the soldiers who do the endless Intelligence Research and Surveillance work so SEAL Teams, DELTA Force, and ODA Teams can go to war, and come home successful. This story is about some of those soldiers, and the consequences of decisions they made when taking on some of the most classified and dangerous missions since the Global War on Terror was announced! From the Cold War behind the Wall in Berlin, to Panama, Central and South America, Bosnia, Haiti, Bogota, Zaire, Rwanda, Iraq, Iran, Afghanistan and beyond, Six Days to Zeus is a series that takes you behind the scenes for a look at 30 years in intelligence. "We train soldiers to go to War. We don't train them to come home!" This new book series, soon to be a movie, is a fabulous page turner. I am a fan for life and cannot wait to read future books by Samuel Hill. Five Stars Plus. I loved this book. I don't know if anyone has ever seen the commercial for the world's most interesting man, but I think we might have actually found him! Chiefs story is so good and so gut wrenching, I actually lost sleep reading this book. I couldn't put it down! Every American should read this book. We need to know what our soldiers go through when they come home, as well as when they re over seas fighting for our freedom. Six days to Zeus describes the unbelievable story and struggles of one of America's bravest warriors and his "Never Quit" attitude. It gives a glimpse into the life of a Tier One Operator. Chief is blown up and loses his entire team. You walk with him through botched surgeries, an evil wife who betrays him, and a dishonest officer who turns on him. You will be inspired by Chief's ability to persevere under circumstances that would have crushed the majority of us and caused us to quit. You won't want to put this book down and no matter what you are going through in life you will be inspired to not only survive but to thrive in the midst of your difficulties. I highly recommend this book! Samuel Hill is a pen name. The Author’s true identity is by law, and subject to non-disclosure agreements, classified until 2085. The author served from March 1976 to July 2006 including both enlisted and officer time. Hill was cited as the Intelligence and Security Command, Commander’s Trophy for Operational Intelligence Achievement (1st Runner Up) after only three years in service, for operational Intelligence 110 miles behind the Iron Curtain during the Cold War. Now 100% Permanent and Totally disabled, Hill is currently writing the series, “Six Days to Zeus” which has been optioned by Phoenix Pictures to become a Hollywood movie.